This entry was posted on Sunday, August 21st, 2016 by Frances Ryan. I need to start this post by saying that I know I am not overweight and I don’t think that I am fat by any means. However, I am getting less and less thin. And whilst some of that is just the normal process of ageing and inevitable metabolic changes, most of it is 2016. Yes, I blame 2016 for the fact that I am getting less thin. Or rather, I am using some of the things that have happened this year as explanations excuses for why I have put on a couple of pounds. Because I know that, ultimately, it’s all down to me and how I managed the balance between my calories-in and my calories-out—regardless of the reasons why the balance was skewed. You see, I am a fair-weather runner. And that means that I rarely run if the weather isn’t fair (or better than fair). So over the course of this past winter, I didn’t run very much. Yet I ate as if I was running. And so I did what many people do: I packed on a bit of winter weight. But I did so knowing full-well that, come spring, I would be running the weight off—either by running in the fair weather, or by participating in one of the many half marathons I had planned (regardless of the weather). By the time running season came along, my belly and bum were starting to jiggle a little bit. Whilst my clothes still fit comfortably, I was looking forward to toning my body up a bit through my calories-out efforts. And then, the day of my first half marathon of 2016, I got sick. So sick, in fact, that I was on bed rest for a bit. And I wasn’t recovered well enough to run my next half marathon in May. But that was OK. At least I was able to get out and run a bit. Slowly, and not very far, but I was feeling better and I was getting out there. And then I broke my ankle. So for the past four weeks, I’ve been relatively inactive. I’ve been (mostly) laid up on the couch resting. Resting… but still eating! Oh yes, those first two weeks I found myself eating quite a bit of high-fat foods. In part because I was starving (bone healing takes energy!) and in part because I was miserable and bored. I was also extremely inactive during those first two weeks. My appetite has slowly decreased since the initial injury which is good, but I am still unable to work on the active calorie burning part of the weight low equation. And that means that the weight I gained over the winter’s lazy months, spring’s bed rest months, and now summer’s inactive months hasn’t been burned off. It’s still sitting there (jiggling there!) on my tummy and my bum. Thankfully, I have returned to the office now. And that means that I am getting out into the fresh air and getting a bit of exercise as I walk to and from the bus stop. But that’s not really enough. No, that’s not enough—at all! I am now at a point where I realise that I really must do something about this now, before it’s too late. My vanity makes me want to be trim and healthy, and my long-term well-being requires me to be trim and healthy, too. So… it’s time to get fit. The first step, of course, is to rein in my eating habits. I need to get back into the habit of taking fresh veggies to the office for my snacks. And I need to get back into the habit of drinking plenty of water not only at the office (easy) but also at home (oddly, more difficult!). I’m also trying a new tactic of enjoying a cup of mint tea in the evenings. I’m finding it to be relaxing as well as a great alternative to an un-needed snack. Of course, one of the problems with my eating habits is that by the time I’m home from the office, my ankle is too sore for standing in the kitchen to cook dinner. I have a few good recipes that don’t take much time, so hopefully that will help. I have also spent some time this weekend cooking meals in advance, which is easier to do since I’m not in pain from travelling to and from the office. The next step is to increase my strength training routine. I need to start using my dumb bells once again (lest my bingo wings enable self-propelled flight!). And I need to be more stringent about my sit-ups and such. Though much of my normal exercises will need to be modified (and some eliminated) whilst my ankle recovers, I will need to do as much as possible to make up for the lack of cardio movements. In two weeks’ time, I will start decreasing my use of the walking boot. That should mean that I will be able to walk a bit more. And by the time I’m completely out of the boot (about eight weeks from now) I will be allowed to run again. Only I don’t know that I will be able to run very far—or very fast—when that time comes. I figure that if I can keep from gaining any more weight before I’m fully recovered, then it will make burning off the final bit easier when I can run again. Even better would be if I can manage to lose some of the weight over the next eight weeks of recovery. But that would mean eating less pizza, which isn’t fun! It’s going to be a long road to (full) recovery and a long road to get back to a firm belly and backside… but I’m game for the challenge. After all, I don’t want to blame it all on my PKD belly! 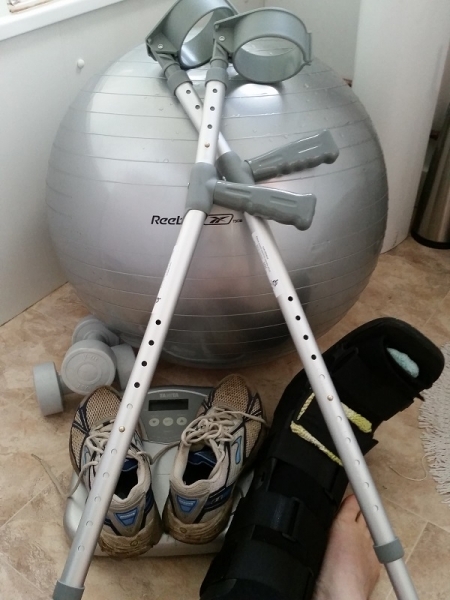 If you have any great tips for how I can lose weight whilst dealing with a broken ankle, I’m happy to hear them! I could really use some fun ways to burn calories from the comfort of my couch! If you have a nutrabullet or similar (and speaking as a fellow ex broken ankle person) a handful of spinach , a banana, some porridge oats and milk. Whoosh it up keeps you full for half a day, which is s miracle if you are me. Also strangely tastes quite good. Even one of my fussy teens said so. That might work quite well. I don’t have a blender, but I have one of those hand-held choppy-blendy-thingies that might work. I’ll give it a try this morning. Plus, the spinach will be good for overall health… leafy greens and all that! Thankfully, my appetite has started to subside a bit so I am not in danger of putting weight on. Now I just need to try to get a couple of pounds off. But I’m able to hobble a bit more now - and a bit faster - so that should help.